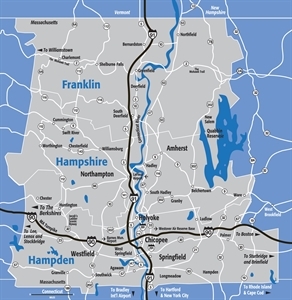 The pioneer valley, part of the Connecticut Valley, expands over 70 towns all across western Massachusetts. Operating at lower costs, accessing one of the nation's leading skilled workforces and enjoying an affordable, high standard of living within urban, suburban, rural or college town settings. The Pioneer Valley is known for its scenery and as a vacation destination. The Holyoke Range, Mount Tom Range, and numerous rolling hills, bluffs, and meadows feature New England's longest and largest river, the Connecticut River, which flows through the region. Less than two miles south of Springfield, Six Flags New England amusement park is located in Agawam; and on mile west of Springfield, The Big E—the collective state fairgrounds of all six New England States—is located in West Springfield. North of Springfield, the U.S. Westover Air Force Base is located in the resurgent, former industrial city of Chicopee. The Chicopee River, although only 18.0 miles long, has the largest water basin in Massachusetts—and along the Connecticut River—at 741 square miles. Across from Chicopee, on the west side of the Connecticut River, the Holyoke Mall at Ingleside (one of the largest malls in New England). Holyoke is also home to the Mount Tom Range of mountains, the Holyoke Canal System, and the Volleyball Hall of Fame. The city of Westfield features Westfield State University. Many outdoor activities are available, such as alpine skiing at Blandford Ski Area and the United States's oldest white-water rafting races on the 78.1 mile Westfield River, the longest Connecticut River tributary in Massachusetts. There are over a dozen colleges, universities and community colleges in the area. In Springfield, Springfield Symphony Hall serves as the major focal point for classical music, Broadway tours, concerts and stand-up comedy shows in the Valley. The buses during the College semesters are free. Run all night and all day. All different routes. The international airport that serves the Pioneer Valley is Bradley International Airport, which is located 12 miles south of Springfield in Windsor Locks, Connecticut. Jan 15.5 F° 25.0 F° 34.5 F° 3.2 "
Feb 18.5 F° 28.3 F° 38.0 F° 3.1 "
Mar 26.5 F° 36.8 F° 47.0 F° 3.3 "
Apr 37.0 F° 48.5 F° 60.0 F° 3.4 "
May 47.0 F° 59.0 F° 71.0 F° 3.6 "
Jun 56.0 F° 67.8 F° 79.5 F° 3.5 "
Jul 61.0 F° 72.3 F° 83.5 F° 3.6 "
Aug 59.5 F° 70.8 F° 82.0 F° 3.4 "
Sep 50.5 F° 62.5 F° 74.5 F° 3.6 "
Oct 40.5 F° 51.8 F° 63.0 F° 3.9 "
Nov 32.0 F° 41.3 F° 50.5 F° 3.4 "
Dec 21.0 F° 29.8 F° 38.5 F° 3.3 "
Spring temperatures are cold with averages in the upper 40's and highs in the upper 50's. Nights are cold with lows in the mid 30's. Summer temperatures are mild with averages in the low 70's and highs in the low 80's. Nights are cool with lows in the upper 50's. Fall temperatures are cool with averages in the low 50's and highs in the low 60's. Nights are cold with lows in the low 40's. Winter temperatures are cold with averages in the upper 20's and highs in the mid 30's. Nights are cold with lows in the upper 10's. Jobs are all around the Amherst Area as well as the surrounding tons. With Amherst, Northampton, Springfield and many more all so close there is thousands of different work options.